It was stated that, There was apprehension along Igbo-Elerin roundabout, off Okokomaiko, Lagos Mainland, earlier today, Wednesday, October 10, 2018, after a petrol tanker fell and spilled its content on the road. 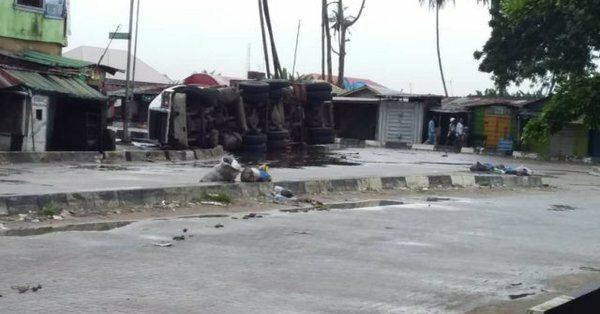 According to reports gathered by Eyes Of Lagos, the driver was said to be over-speeding and tried navigating the roundabout when the tanker fell. Presently, residents of the axis are reported to be under fear due to the developments. In addition, some suspected hoodlums are said to be scooping the product from the drainage at the other end of the road. However, men of Nigeria Police are said to have cordoned off the roads leading to the roundabout.